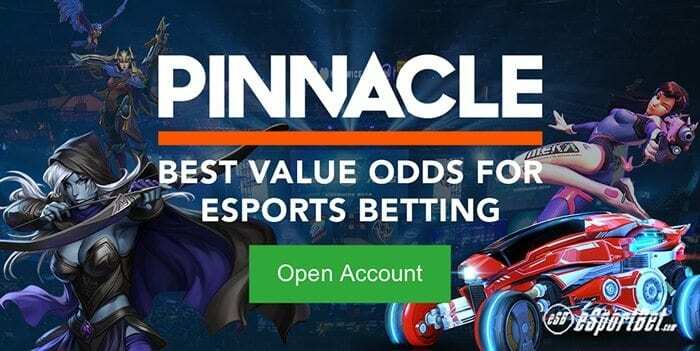 Pinnacle Sportsbook is one of the world’s best esports betting sites thanks to its best value odds and dedicated betting markets and options for practically every single major and up-coming tournament for CS:GO, Dota 2, Hearthstone, League of Legends, Overwatch and Rocket League – just to name a few of the most popular titles supported on the site. It was one of the first sportsbooks to take esports betting seriously, with the first cash-bet taken on StarCraft II on the site in 2010. Since then, they have accepted over 5 million esports bets and won the EGR eSports Operator of the Year 2017 and SBC eSports Bookmaker of the Year 2017. This review will cover Pinnacle’s current esports betting markets, licensing and regulation, customer support, payment methods and more to determine whether it is worthy of its widespread reputation as one of the best esports betting sites among esports and video gaming communities. Pinnacle is licensed in Curacao and Malta and accepts players from a large variety of jurisdictions. Pinnacle requires all new sign-ups to be over 18 years of age or above the legal age for gambling in your country or state of residence, so be prepared to provide proper documentation when registering an account. Pinnacle’s licensing and regulation in Curacao and Malta is great because it reaches the widest possible international esports betting customer base. Unfortunately, there are regional restrictions when taking other countries complex gambling laws into account, so some people will miss out. If you reside in one of the following countries, you unfortunately cannot bet at Pinnacle at this time of writing: United States of America and its territories, Czech Republic, France, United Kingdom, Netherlands (including Curacao and other countries and territories that form part of the Kingdom of Netherlands), Spain, Germany, Singapore, Democratic People’s Republic of Korea, Denmark, Philippines, Syria, Turkey, Poland, Ireland, Slovenia and Sudan. If you are searching for an esports betting site accepting customers from your country, we recommend reading our esports online betting guide to find locally licensed and internationally regulated sportsbook sites that best suit you. Does Pinnacle have any bonuses or promotions? Pinnacle is a bit of an oddball compared to other esports betting sites in that it does not have any sign up bonus, cashback offer or special promo codes for new customers to take advantage of. Instead, the site focuses on providing the best value odds (best betting line and lowest margins) for its customers – and this extends fully to its esports betting markets. They also make up for the lack of bonuses with higher betting limits and acceptance of arbitrage betting. In addition, Pinnacle have a well known reputation among the esports betting community of never banning overly successful winners, which is unfortunately a common occurrence at other online sportbooks. Instead, the site shifts odds and betting lines based on the successful player’s betting activities. In our experience betting on esports with Pinnacle, the lack of bonuses aren’t missed because they actually measure up to their promise of best value odds- and we didn’t mind not having to deal with clearing overly excessive wagering requirements attached to our bonuses just to be able to withdraw our hard-earned winnings. Pinnacle follows the traditional online betting site design for its desktop and mobile sites, but it has a dedicated hub for all things esports betting that separates it from the pack. For desktop users, Pinnacle sportsbook is fully accessible via Linux, Mac OS X and Windows PC and loads clean and fast in all modern Web browsers. The black, gray and orange aesthetic is easy on the eyes ad not as outlandish as some other outdated online sportsbooks out there. All of Pinnacle’s esports and traditional sporting betting markets are displayed on the left-hand side of the main betting lobby, with expandable sub-menus which neatly organise every single league and tournament Pinnacle are currently taking bets and keeps things from cluttering up the interface. The main horizontal nav-bar at the top of the lobby provides quick links to the other sections of the site in order: Sports Betting, Casino, Live Casino, Esports, Betting Resources and Mobile. Pinnacle’s mobile site is condensed neatly for the smaller screens and touch-based inputs of Android, iOS, Oppo and Windows mobile devices. The latest matches for featured sports display by default on the home-page, but you can still access the esports betting markets quickly by tapping the menu button and navigating over to the esports section for live odds, upcoming matches and early markets. Pinnacle also have a mobile app available to download on Apple’s App Store and Google Play called Pinnacle Lite, which has a similar interface to the regular mobile site but is a lot faster and more convenient if you plan to make regular bets on the latest tournaments. You can also set alerts to get notifications on when the match goes live. Pinnacle.com’s esports betting markets are some of the best on the Web. They take bets on the world’s most popular esports tournaments must-haves and and was one of the first sites to open up betting markets on lesser-known, or otherwise niche esports. Pinnacle have a wide range of available payment methods that you can use to deposit money for esports betting and withdraw any potential winnings hassle-free and within a reasonable time-frame. There’s also plenty of options available so that customers from all the countries currently accepted will be able to use at least two of the services supported. Combined with support for a number of the world’s currencies and Pinnacle is widely accessible for the average bettor purely judged on their payment options. Users from other accepted countries will have to take note that currency conversion fees apply prior to wagering at Pinnacle Sportsbook. Pinnacle displays its content in English by default but fully supports up to 16 other languages for its international customer-base. The language settings can be toggled by clicking (or tapping if on mobile) the flag button on the top left-hand side of every page (next to the Pinnacle logo). Currently supported languages on the site include: Chinese, Czech, English, Finnish, French, German, Hebrew, Italian, Japanese, Korean, Norwegian, Polish, Portuguese, Russian, Spanish and Swedish. Pinnacle has a responsive and helpful customer support team that answered our queries regarding esports betting basics and payment processes quickly and professionally. Their reps were a lot more knowledge with their available esports markets compared to other sportsbooks, showing they clearly recognise the popularity and value of the booming professional gaming scene. Newbies totally inexperienced with betting on their favourite esports will be happy to know the reps will be able to help them through every step of the way should they need additional assistance. Pinnacle.com is great for both experienced bettors and esports fans completely new to the concept of online wagering but want to find a newbie-friendly destination with plenty of customer support and FAQs along the way.